When I’m good, I’m very, very good, but when I’m bad, I’m better. Man: You were wonderful tonight. 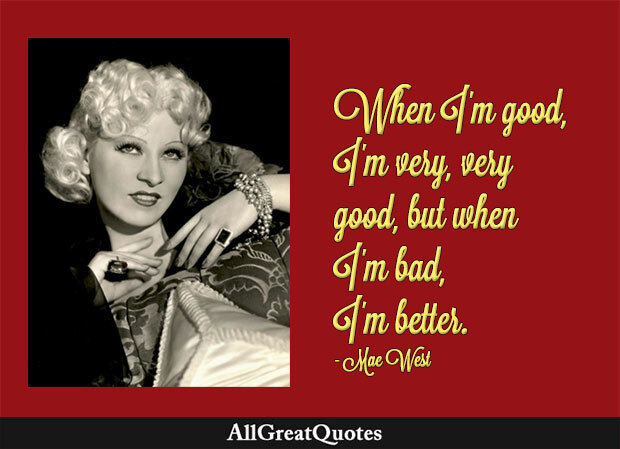 Mae West: I’m always wonderful at night. I wrote the story myself. It’s about a girl who lost her reputation and never missed it. Mae West: You can … hundreds have. She’s the kind of girl who climbed the ladder of success, wrong by wrong. I’m no angel but I’ve spread my wings a bit. I’ve been things and I’ve seen places.